If you want to replace your current camera bag this year or invest in a more comfortable, roomier one, then Tamrac is a great brand, because they offer high-quality camera bags in a variety of sizes. 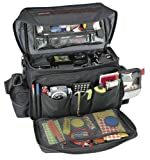 No matter whether you are a hobby snapper, taking pictures whenever the mood suits you, or a professional photographer, there are plenty of Tamrac camera bags you can look at, and they will be comfortable to wear and certain to protect your valuable camera and expensive lenses and other photographic equipment. A neck strap is not enough when dealing with your camera. What happens if the weather turns bad? Unless you are using an underwater camera, most cameras do not like the rain. And where are you going to stash your extra lenses? If you like to use a zoom lens sometimes and maybe a wide-angle lens or another kind, bear in mind these cost hundreds of dollars each, so you are not going to want them in your pocket or rolling around at the bottom of your tote bag. Choose this, and you will get a camera tripod with carrying case, 6-piece lens and camera cleaning kit and a backpack too – everything you need if you are going out for the day to take photos. This does not look like a typical camera bag but, for security reasons, that is a good thing. The camera compartment is padded with foam, and it has a weather flap too so you can keep your precious camera dry. There are a couple of mesh pockets on this backpack so you can store water bottles and accessories, and there is a sternum strap and waist strap so you can carry your camera and photography accessories in comfort. The tripod is handy, and it has a strap and carries case with it, and the cleaning kit contains all you need to keep your camera and lenses spotless. Choose the Tamrac 5546 Adventure 6 Digital camera bag if you want to transport a digital with its 3.5-inch lens in place, as well as an extra lens and a variety of accessories. This pack is sleek and cool looking and does not look like a conventional camera bag. Slip your jacket, lunch or anything else you want to carry into the top part and stash your camera and accessories in the bottom part. This is handy if you are going out for the day to take pictures. Why bring a backpack and a camera bag if you can get everything into the same pack? 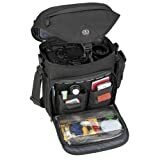 Take a look at the Tamrac 5564 Explorer 400 Digital SLR camera bag if you have a DSLR with a 5-inch lens, as well as additional lenses and other accessories. Slip your cell phone or a bottled beverage into the side pocket and use the rest of the pack to keep your camera safe, clean and dry. This one comes with a rain cover, so your camera will never get wet. The Tamrac 5513 Adventure Zoom 3 Digital SLR camera bag holster case comes with a camera tripod and carrying case for that, and a 6 piece lens and digital camera cleaning kit. The pack itself holds a digital SLR with a 3-inch lens attached to it, and there are small pockets in this pack so you can bring your other accessories along too. The tripod is 57 inches and will maximize your image quality. If camera shake is every a problem, the tripod will hold the camera still so you can take clear images. This backpack is comfortable to wear, and you can use it to stash a DSLR with a 5-inch lens attached, as well as a flash, camera accessories, and more lenses. There are other pockets where you can keep your accessories, and there is a battery management system in the front pocket. There is also a removable rain cover, and you get a tripod with its carrycase too, as well as a camera cleaning kit, so if you grab this as well as your camera, you will have everything you need to go out taking pictures for the day. 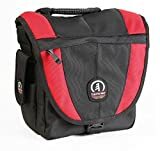 This is one of the best Tamrac camera bags to choose if you want to protect your precious photography items and wear a backpack which is not going to let you down. This well-made bag is sturdy and roomy. Although it is lightweight, it offers great protection for your camera and all its accessories. Tamrac is one of the top brands to go for when you are shopping for the best camera bags because they are ideal for the job and get such high ratings. 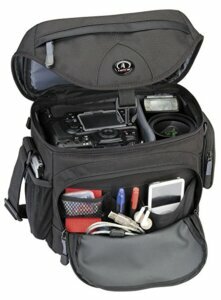 You can fit a compact digital SLR in this bag along with its 3-inch long lens attached. There is a front pocket where you can keep batteries and memory cards, and you also get a shoulder strap, belt loop and carrying handle, so you can choose how to carry this bag. There are other pockets too, where you can keep lens-cleaning supplies and other photography accessories. This bag holds a surprising amount of gear, and you can use it as your second carry on when you are flying because it will fit under the seat. This bag is very well made and will last for years. Spray the outside with water-repellant spray every couple of months, just to ensure it stays waterproof. So what can you fit in here? Try a pair of SLRs with their lenses, as well as various other lenses and all your camera accessories. The bag offers great protection, and it is the largest of Tamrac’s 5000 series camera bags. There are plenty of compartments and pockets so you can see where everything is at a glance. Cameras can be heavy and bulky to carry around, but if you put all your gear in one bag like this, you will find it to be a comfortable and well-balanced way of transporting your photography materials from A to B and keeping them well protected. Use this bag to carry your camera as well as various filters and lenses. There is a little pocket for batteries, SD cards, and other small accessories, and you can even fit a small tripod in here. The bag is very comfortable to carry around, and it should last for years because the stitching is very strong. A camera bag is more expensive than some other types of the backpack, but when you consider the protection it gives your precious photography equipment, then you will agree it is worth it. Using a flimsy camera bag is just not worth the risk. This Tamrac bag is very well made, and you can fit lots in there. Exactly what you choose to store in your camera bag depends largely on the side of the bag. For example, something small designed to hold one camera and very little else will only hold the bare essentials, but of course, it will be lighter and easier to carry around. Something large offers plenty more storage space, but it is still a good idea to use this wisely. Every photographer has his or her own needs, but it is still worth considering what you are going to take with you when you go out to take photos. The most obvious items will be your camera, lenses, batteries, memory cards and flash. First of all, look through your camera bag and see if there is anything in there you have never used. If so, just remove it, else you are adding weight and taking up the space that could be used for something else. One powerful tool a lot of photographers opt for is a tablet such as an iPad or Android device. Use this to edit images in a mobile version of Photoshop or share them on social networks. You can also use the tablet to navigate to the event you are taking photos at or calculate the position of the sun. Tablets offer plenty of apps for photographers. Something else to consider is gaffer tape, which is strong enough to hold things together yet will peel off without leaving a sticky residue. This can be used for various things. A sensor cleaner is also useful. Choose a professional one because the sensor can be damaged if improperly cleaned. Because sensitive digital camera electronics and raindrops do not tend to go well together, you might like to consider a storm jacket cover for the camera, to protect it from the elements. A polarizer is something else which is handy to keep in your Tamrac camera bag. This device will cut glare and take the shine off leaves to reveal the true, rich color underneath. It can also offer a wonderful contrast between fluffy clouds and the sky, and add a special dramatic blue hue to the sky in your shots. Have you seen the latest pocket photo printers on the market? These are the hi-tech, modern equivalent of the Polaroid camera, and will print from any camera or camera phone that is NFC-enabled. The 3 by 2-inch prints it produces are cute! Once you have taken one of these to break the ice, whoever you are shooting will be delighted to pose for more pictures. This is an excellent way to encourage strangers to pose for pictures when you are traveling. A lens cleaner cloth is something else you can fit into any camera bag. Hook this on to an outside attachment on the bag and wipe the lens clean whenever necessary. A tripod is another idea, and you can get surprisingly compact ones these days, to fit in even the smallest Tamrac camera bag. Case Logic has been fulfilling needs of computer and electronic buffs for years. From CD and DVD cases to Portable Electronics to GPS to Luggage and Backpacks. They have a great reputation for inexpensive but high quality. They are not camera hounds (like the Tamrac folks) but they make a fair camera backpack. With their Case Logic DCB-309 DSLR, Laptop And Camera Backpack. They enter a laptop and camera backpack into the arena along with Lowepro and Tamrac. This one is the cheapest of the three. How’s the quality? Tamrac camera bags are great because they allow you to transport your iPad, camera gear, and everything else you want to protect. Cameras and similar electronic equipment are expensive, so it makes sense you will want to invest in one of the tops selling Tamrac camera bags so that you can protect your camera, lenses and other photographic items. You can get little bags for your point and shoot camera, long ones for a tripod, or large bags you can fit everything in. These bags are top quality, and they are made of ballistic nylon. The Dual Foam Technology features close-celled foam and open-celled foam. The close-celled foam offers shock protection, and the open-celled foam gives a custom fit and dampens vibrations. Slot your compact card reader, SD card or cellphone into one of the side pockets. The inner fabric is smooth nylon, which will not make lint or accumulate dust. The top of the bag flips over, protecting your camera from rain or splashes, and it means you can open it quickly to get your camera out. 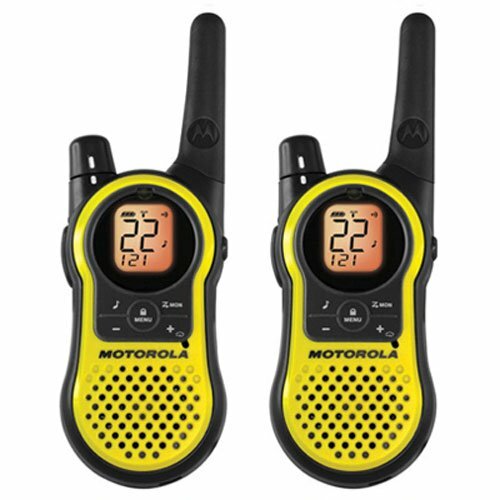 The digital zoom bags feature a red flag system in the front pocket so you can keep full batteries and empty ones apart, and also keep your full memory cards apart from ones with space on. 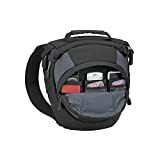 A lot of camera bags offer adjustable compartments, and you can change them around using Velcro inserts, so your camera and accessories fit in there perfectly. It is a good idea to decide what you are going to pack in there the day before you go out taking photos, so you are not in a rush to fit everything in. Decide on the most important items then add any others you would like to have, followed by whatever else fits in there. You will not need all your lenses or filters, for example. Consider what the lighting is going to be, and take a spare battery, spare memory cards, and so on. Your gear should fit snugly, and nothing should wobble around if you shake the bag. Of course, you do not want metal, hard plastics or glass to smash against each other when moving your bag, so limit one piece of equipment per padded compartment, and use the Velcro dividers wisely. Once you have done this and sorted out what to pack, you might not want to change the configuration of your camera bag again. You will want to focus on taking photos once you get to the location instead of messing around with your camera bag. So how about the other items that go in your camera bag? These are best kept in the side zip pockets, first, so you know where to find them, and second to keep them tidy so your camera bag does not get messy and disorganized. Pack your flashes snugly just like your camera bodies and lenses, to keep them safe. You will want to be organized, keeping your batteries in one outside pocket, for example, so that you can find them immediately. If you need to swap your battery or SD card, you will want to be able to find the new one immediately, and if you are using a large camera bag with 10 external pockets, well you get the picture – keep things in the same place and you will be able to locate them quickly and easily. Of course, investing in a good camera bag is the most important thing of all. There is no point in getting one which is too small to hold your gear or too big for you. You will also want a quality bag so you can keep your expensive camera gear safe. Do not rush into buying a camera bag; instead, take the time to work out exactly what you need and then you can be sure of a great purchase, something that is going to be a joy to use for many years to come.